Essential oils improve mood when used on certain areas on the skin or in a diffuser. So look no further than essential oils to uplift your mood. Essential Oils can be used for many things and I’ve already mentioned the top 3 reasons to use essential oils. But, did you know that essential oils improve mood too? It’s true! Certain essential oils can can also help uplift your mood or emotional state. Essential oils can play a big role when it comes to your mood! They can help to promote relaxation, boost/uplift your mood, help you focus, and even help with managing anger! Essential oils on their own will help but for best results it is encouraged that you also lead a healthy lifestyle including healthy eating, having a restful sleep and getting regular exercise. Which Essential Oils Improve Mood? There are a number of essential oils that can assist with uplifting your mood. 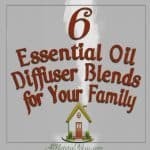 When using essential oils for this purpose, people often add the essential oil into their diffuser so that it can be smelt throughout the home. Another fantastic way to benefit from uplifting essential oils is to add a few drops into a diffusing necklace. If you do not have a diffuser or diffusing jewelry, add a few drops to the palms of your hands, rub your hands together and cup them over your nose. Slowly inhale through your nose and exhale through your mouth. If you prefer, you can also apply these oils to your throat, over your heart or to the soles of your feet. If applying citrus essential oils, remember to make sure that they aren’t exposed to direct sunlight as discussed in this post. Like the uplifting oils, calming essential oils can be used in a diffuser or you can make a makeshift diffuser using your hands to allow you to receive the aromatic benefits of calming essential oils. Many people choose to apply the calming essential oils to the side of their neck, back of neck, wrists or soles of their feet (pick a location that feels best for you, do not apply to all of these spots). Read about essential oil safety here. Rocky Mountain Oils also carries a number of essential oil blends which are unique and very helpful for managing your mood! Each of the blend names are very self explanatory, for more information about each blend simply click on the links below! As you can see, there are many different uses for essential oils for managing your mood! What has been your experience with using essential oils to manage your mood? There does seem to be an endless number of them! I am a huge lavender essential oils lover, actually I love everything lavender. I was a big skeptic when it came to essential oils, now I am a believer. Lavender is actually the first oil I tried. I used it on my daughter when she was a baby to help her sleep better. I’ve been loving essential oils lately!! I just started using them and I am so impressed by what they can do!! I am really wanting to try oils! Thanks for this information. I found your post from Pinterest! I love talking essential oils, how they have changed my life and how they can help change yours. I prefer lavender oil because it contains the chemical linalool and linalyl acetate which have been found in multiple studies to be associated with decreasing anxiety and improving mood. Lavender is definitely one of our favorites!